Newton’s First Law states, in effect, that the ‘natural’ movement of a particle ― Newton says ‘innate’ ― is to travel in a straight line at constant speed. In consequence, any deviation from this ‘natural’ state requires explanation and the conclusion to be drawn is that the particle has become subject to interference from an outside source (Newton’s Second Law). After the square and the rectangle, the circle is probably the best known regular shape though there are precious few examples of true circles to be found in nature ─ if we are so familiar with it, this is largely because of the wheel, one of the most ancient human inventions. Plato, enamoured of elegance and simplicity rather than actuality, considered that heavenly bodies must follow circular paths because the circle was the ‘most perfect’ shape (Note 1). Greek astronomy, as we know, dealt with departures from circular motion by introducing epicycles, circles within or on other circles. It would probably be possible, though hardly convenient, to trace out any regular curve in this manner and the Ptolemaic system proved to be a satisfactory way of calculating planetary orbits for nearly two thousand years. However, for reasons that are probably physiological in origin, we do not feel at ease with anything other than straight lines, squares and rectangles and a good deal of mathematics is concerned with the problem of ‘squaring the circle’ or, more generally, converting the areas and volumes of irregular shapes into so many squares. Newton, following Galileo, broke down circular motion into two straight-line components at right angles to each other : one tangential to a point on the circumference of a circle and the other along the radius from that point to the centre of the circle. He furthermore proposed that circular motion could be modelled in the following manner : the original tangential velocity did not change in magnitude but did change repeatedly in its direction and by the same amount. We do not normally view a change in direction as an ‘acceleration’ and Newton, writing in Latin, did not use the term. However, in Newtonian mechanics we consider any deviation from constant straight-line motion to be an ‘acceleration’ which, according to Newton’s Second Law must be due to the action of an outside force. He coined the term centripetal or ‘centre-seeking’ force (after Latin peto, I seek) to characterise this force. What is more, since gravitational attraction was permanent and did not change in magnitude over relatively small distances, a particle subject to such a force would deviate repeatedly from its current straight line motion and deviate by the same amount each time. If the original velocity was ‘just right’, the particle would keep more or less at the same distance from the attracting body while perpetually changing direction : the result if the attracting body was very much larger being motion in a circle around that body. There can be little doubt that Newton based his mathematical treatment of circular motion on personal experience while generalising the principles involved, by a giant leap of thought, to model the motion of heavenly bodies. On the second page of his Principia he mentions in his Definition V how “a stone, whirled about in a sling, endeavours to recede from the hand that turns it; and by that endeavour, distends the sling, and that with so much the greater force, as it is revolved with the greater velocity” (Principia, Vol. I Motte’s translation). It is a matter of experience (not theory) that a whirling conker or other projectile exerts a definite pressure on your finger, or on any other object that serves as an axis of rotation, and that we feel this pressure more or less on the opposite side to where the conker is ‘at that moment’. Secondly, as Newton says, the faster the whirling motion, the more the string cuts into your finger. Thirdly, if we use a rubber connection we can actually observe the ‘string’ being extended beyond its normal length. And finally, if we cut the string or otherwise break the connection between particle at the circumference and the centre, the particle flies off sideways : it never flies off directly inwards nor, as far as we can judge, does it continue to follow a circular trajectory. In the modern treatment of motion in a circle we have a particle which is at rest at time t = 0 at position P0 on the circumference of a circle of radius r. It is propelled in a direction tangential to the circumference of the circle at an initial velocity of v metres/sec. At time t it has reached the point P1 having travelled vt metres while the angle at O has turned through θ radians. Since it has travelled in a straight line along the tangent it has covered r tan θ metres while a particle travelling along the circumference has travelled in the same t seconds a distance of rθ metres if θ is in radians. If we have an angular velocity of ω radians per second this distance is rωt metres. Now, v, the speed of the particle travelling along the tangent, is not the same as rθ/t = rω, the speed of a particle travelling along the circumference, since r tan θ > rθ. Now, the particle supposedly always maintains its constant speed but each time it is in contact with the circumference changes direction and pursues a path along the tangent at that point. In the usual modern treatment, we take two velocity vectors v1 and v2 corresponding to the velocities at two points on the circumference of a circle when the angle at the centre has turned through θ radians. These two velocities are, according to Newton’s treatment of circular motion, equal in magnitude but differ in direction and the angle between the two vectors is the same as the angle at the centre. We now evaluate the closing velocity vector which is considered “for very small angles” to be approximately equal to vθ as if this closing vector, instead of being a straight line, were part of the circumference of a circle with radius v metres subtended by the angle θ. We thus end up, after some manipulation, with an acceleration vector of rω2 = v2/r metres per second per second, setting ωr equal to v. Since F = mass × acceleration , the centrifugal force is mv2/r for a particle of mass m.
Thus according to textbooks aimed at engineers and technicians. 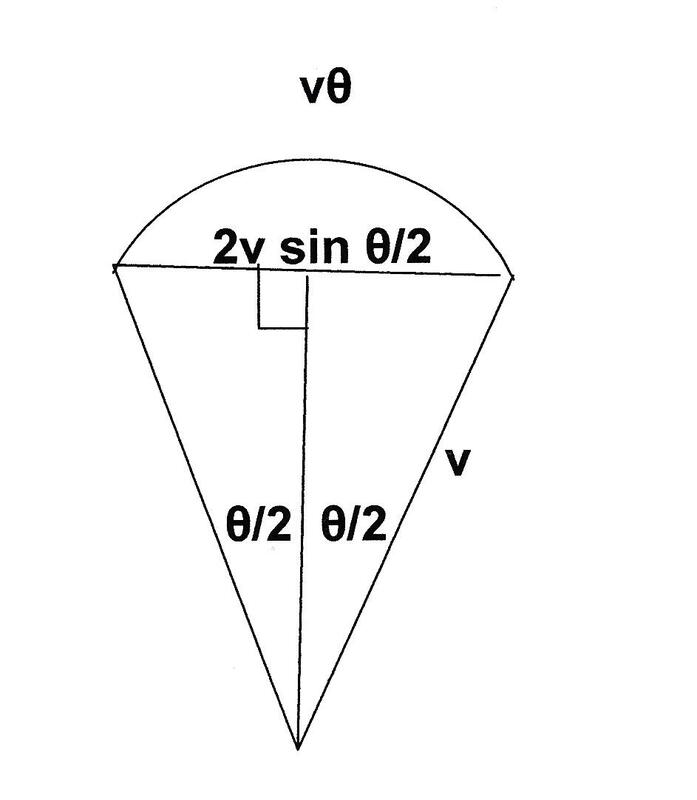 In textbooks aimed at pure mathematicians it is stressed that what we have here is a double ‘passage to a limit’, that involving v and rω and that involving 2v sin θ/2 and vθ . Fpr, in reality the closing vector would have length 2v sin (θ/2) which goes to vθ because the ratio (2v sin (θ/2)) : vθ = v sin (θ/2) : v (θ/2) tends to the limit v as θ/2 → 0. But what these textbooks do not make clear is that these limits are never attained since tan θ is never strictly equal to θ and sin θ/2 is never strictly equal to θ/2 for any 0 < θ < p/2. As before we have a particle P is at r units of distance from O, the centre of an imaginary circle. It is projected along the tangent at P0 with speed v units distance/units of time and at time t it is at P1 having traversed vt units of distance. At time t the angle at O has gone through θ radians so that vt = r tan θ. So far, so good : everything is as in the normal treatment. However, note that t is integral being ‘so many ksanas’ ― a ‘ksana’ is the minimal interval of time, equivalent of the vague ‘instant’. Also, v is a rational number since it is the ratio of an integral number of grid positions to t ksanas. If the ‘particle’ (repeating ultimate event) takes 4 ksanas to reappear 7 grid positions further along, the speed of reappearance is 7/4 spaces/ksana. It is not to be supposed that the particle covers two and a quarter spaces in one ksana since the spaces are indivisible, only that four ksanas later the particle reappears seven positions to the right (or left as the case may be) to where it was before. Moreover, these distances are ‘unstretched’, i.e. the grid positions are conceived to occupy ‘all’, or practically all, of the distance between two occupied positions. Just as in Special Relativity, we consider measurements made from inside an inertial system to be ‘standard’, in Ultimate Event Theory we start by evaluating distances from the standpoint of a regular repeating event not subject to influence from other event-chains. The repeating event E is such an event since it is (not yet) subject to an outside influence : it maintains a constant speed of s spaces per t ksanas and its speed if s/t spaces per ksana. r is likewise integral in Ultimate Event Theory since it is so many (unstretched) spaces from O. Now this spatial distance does not have to be integral, that is, correspond to a whole number of positions capable of receiving ultimate events. (Note 1). The initial displacement of the particle, once it has been impelled along its path, is unaccelerated and thus, by definition, not subject to an outside force. However, this displacement does have an effect on a similar initially unaccelerated body situated at the centre O (since the distance between the two particles has increased). This ‘action’ at O calls forth an ‘equal and opposite reaction’ according to Newton’s Third Law and exactly four ksanas later the ‘particle’ appears on the circumferenceat P2 with the same speed and proceeds along the tangent at P2 ― this according to Newton’s treatment of motion in a circle. 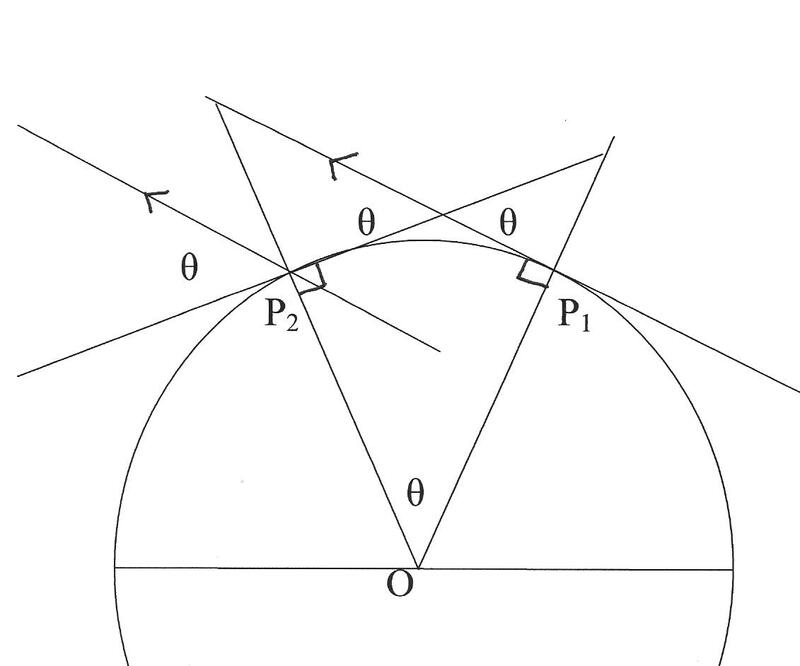 In event terms we have an event E originally appearing at P0 exactly r spaces from O, reappearing at P1 outside the imaginary circle t ksanas later, and finally appearing at P2 where it will travel along the tangent at P2 at the same speed v = m spaces per t ksana ― in this particular case 7/4 spaces/ksana. The first displacement calls forth an ‘equal and opposite reaction’ according to Newton’s Third Law and exactly four ksanas later the ‘same’ ultimate event repeats on the circumference of the imaginary circle at P2. By hypothesis, it has the same ‘reappearance speed’ of v spaces/ksana ― in this particular case 7/4 spaces/ksana. Although it has the same speed, event E has been subject to an outside influence since it has changed its straight-line event-direction : it has been, in Newtonian terms, accelerated and subject to an outside force. This force, or rather influence, originates in the reaction of the event-chain situated at the centre O . The reaction will be, by Newton’s Laws, equal in magnitude to the original force to which the body (event-cluster) at O was subject. It is essential to grasp the succession of events. When travelling from P0 to P1, the particle/event is not subject to any outside influence : this influence is in operation only for the second t ksanas during the passage from P1 to P2. Similarly, once at P2, the particle/event is again free of outside influence for t ksanas and the entire cycle action/reaction repeats indefinitely. This is so in the Newtonian treatment as well but there is a tendency, even in authoritative text books, to assume that because action and reaction take place in such swift succession that they are strictly simultaneous. So how do we evaluate the strength of the restoring force which in Newtonian Mechanics is known as the centripetal or centre-seeking force (from Latin peto I seek) ? We can do this by comparing the distances along the radial direction and noting the changes in speed. The particle/event starts off with zero speed in this direction since it is situated on the circumference; it is at a distance r (1/cos θ – 1) from the centre O t ksanas later and t ksanas later still it has once more zero radial speed having recovered its original configuration. We wish to have this distance and the eventual radial acceleration in terms of r and v rather than θ, since r and v are ‘macroscopic’ values that can be accurately measured whereas θ is microscopic ― what used to be called ‘infinitesimal’. Since θ is not a macroscopic value and is certainly extremely small, we may take the limit as θ → 0 (Note 2). The acceleration is thus 2 v2/r spaces per ksana per ksana and the centrifugal ‘force’ on a particle of mass m is 2m v2/r (Note 3). Note 1. In reality, all orbiting bodies eventually move away from the centre of attraction or fall towards it as even the Moon does — but so slowly that the difference from one year to the next is only a few centimetres. Note 2 The ‘stretched distance’ between two occupied spaces does not (by hypothesis) contain any more grid positions than an unstretched and the extra ‘distance’ is to be attributed to the widening of the gaps between grid-points, i.e. to the underlying (non-material) ‘substance’ that fills the Locality. This stretched distance is essentially a mathematical convenience that has no true existence. All that actually happens and that is, or could be, observable is the occurrence of a particular ultimate event at a certain spot on the Locality at a particular ksana and its reappearance at a subsequent ksana at a spot that is not exactly equivalent to the previous position (relative to some standard repeating event-chain). Note 2. It must be stressed that this limiting value, like practically all those which occur in Calculus, is not actually attained in practice though one assumes that in such a case as that considered the approximation is very good. The value of θ in any actual occurrence will certainly be small but not ‘infinitesimal’, a term which has no meaning in Ultimate Event Theory (and should have none in traditional mechanics either). Note 3 It remains to give a satisfactory definition of ‘mass’ in terms of Ultimate Event Theory. Newton calculated mass with respect to area and density and spoke of it as “a measure of the quantity of matter in a body”. In traditional physics mass is not only measured by, but equated with, the ability of a particle to withstand any attempt to change its constant straight-line motion and in contemporary physics mass has virtually lost any ‘material’ meaning by being viewed as interchangeable with energy.